There are plenty of reasons and many potentially motivating factors to update a bathroom. Perhaps enhancing resale value is the priority, or there’s a desire to add capabilities, luxuries, or storage. Perhaps your ambition lies among ‘all of the above’. This type of practical indulgence requires a number of aspects be considered. Obviously the most important is the same factor each one of us deals with every day in one capacity or another – budget. Determining your price range, naturally, is your first step. The size of your project demands careful consideration, as well. Sure, a general fixing-up may serve its purpose for resale, but what if you plan on staying? Then you’re doing it for yourself, and you’ll want to guesstimate how many years your reconstruct needs to serve you. 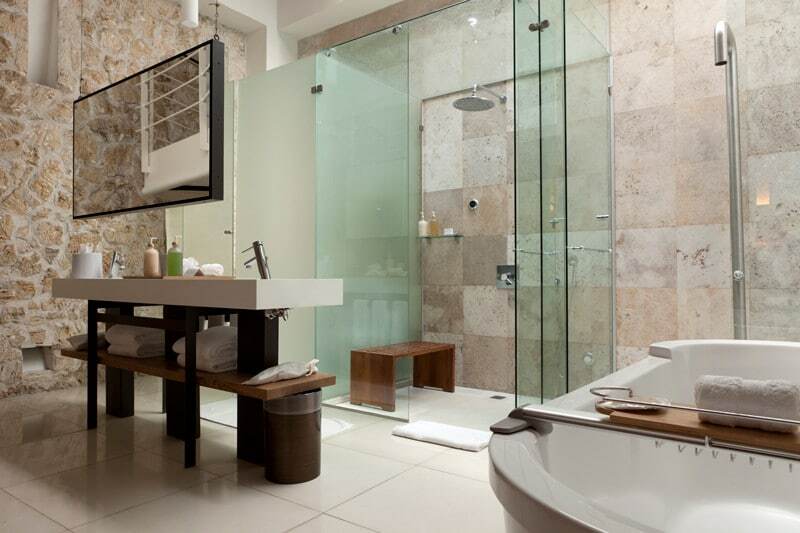 Assume there are three levels to a bathroom remodel – basic, mid-level and high-end. Naturally, costs will vary, dependent on a variety of circumstances, but for your ballpark consumption we have listed costs in a general sense to help give you an idea of what potential monetary amounts you would be looking at. Be mindful that renovating a bathroom that was built in, say, 1990 will likely be less trouble than one from 1950. Related elements such as this will have an effect on the costs you experience. For the sake of generality, a Basic remodel will run you between three to ten thousand dollars. In this price range, you likely won’t be doing any plumbing renovation, although you could easily replace fixtures and other materials. You’ll have your choice of quality off-the-shelf items, and you may consider adding a backsplash to lively up the aesthetic. As far as replacing countertops in a basic remodel, you would have your choice of lower-end granite or cultured marble. Re-tiling the entire bathroom might be cost-prohibitive although you could consider doing a single area – like the shower. Ceramic or standard white subway tiles are affordable in this range. If you’re looking to update your walls, painting them would be your likely choice given the circumstances of this scenario. Hopefully, you can keep your existing cabinetry; otherwise you may be limited to off-the-shelf models. In order to make this remodel “pop” spend a bit on accessories. Install a new light fixture or cabinet hardware, anything that you can use to enhance your desired concept. A mid-level remodel will give you a bit more freedom with an average budget of ten to thirty thousand dollars. You’ll certainly be able to install better fixtures, like a new modern toilet, or advanced flow faucets. 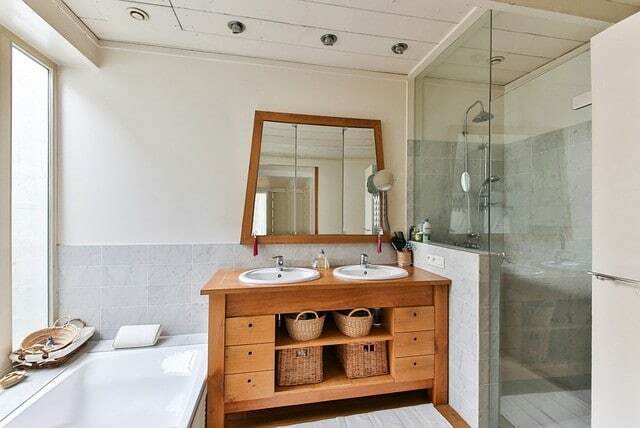 You’ll probably want to look at new flooring, and replace the current vanity and lights. You can also consider window treatments, new hardware (how about a luxurious framed mirror?) and a medicine chest. Naturally all will be of quality superior to that of the big-box stores. You may even do some minor construction changes, like put in a different sized tub than what was there previously. You could even add an additional cabinet. The countertop could be made of a high grade remnant, or even a custom piece of granite marble or quartz. Also afforded are semi-custom cabinets with nicer finishes. Want them glazed? Want decorative details like elegant door panels? No problem. You’ll also be able to make reasonable plumbing adjustments, limited to say, moving the shower. Also, consider high quality copper or bronze fixtures. Also, indulge your passion for porcelain tile. It’s more durable than the alternatives like ceramic, and it is slip resistant too. Have fun customizing with materials such as classic beadboard or tile walls. A high-end remodel is one of deluxe personal indulgence. You’ll be replacing everything, and it could run you from thirty thousand dollars to infinity! It is entirely customized to your taste and precise specifications. You can do anything, even move the toilet and add a sauna. You’re looking at all new high-end fixtures, materials, cabinets, lighting and finishes. Plus you can have the craftsmanship of detailed molding, trim work and tiling. You’d likely want the top quality of solid wood construction cabinets with a custom finish and elegant accents. Spare no expense with your tile and get beautiful natural marble limestone or granite (yup, the ones that are extremely labor intensive and hard to cut). It’s your choice when you’ve got the funds to create the bathroom of your dreams. Not everyone has that kind of budget, but that doesn’t mean that your remodel will be any less satisfying. Simply determine the category of remodel you fit into, and be efficient, plan to maximize the output from your total. Be mindful that approximately 17% of what you spend will pay for installation. Fixtures will run you about 10% while the cabinetry and hardware could cost you 16%. Countertops will likely run at about 7% and flooring will be around 9%. Another big expense is plumbing, at 14%. The remaining factors including design fees, lighting, ventilation, doors, windows, walls, and ceilings make up the difference. Expect to set aside a month or two for the job to be complete. And remember, the more time you invest in planning the project’s logistics, the greater success it’s likely to be.